Hi loves! Getting through the week alright? Hope you are! Today I got a lovely polish to show you that isn't as easy available anymore at the moment compared to before. This is a england Princess Sabra, and as you might know England has Royal Mail, and Royal Mail has decided you can't hip nailpolish since it's a dangerous product. Sooo... right now, the free world wide shipping isn't really an option for Adina. I really hope she finds a way to make this work and if it it costs a bit, I don't mind, I love a england! Princess Sabra was released as part of the The Legend collection. At first I thought I didn't need this but with the last big sale I figured why not? And I did not regret ♥. 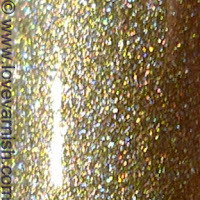 A golden olive toned polish with holographic sparkle, based on the color of Tristam's eyes (Adina's cat), that looks outstanding yet subdued at the same time, a polish you can combine so easily. I needed 3 coats for opacity (not what I am used to from a england I must say) and with a topcoat it dried to a high gloss finish. Do you own this one? And what is your favorite a england? So gorgeous! I *think* I have this one....I don't remember, lol. It's too bad about their shipping. Hopefully they can figure out something soon. Thanks Angie. Hahaha go check quickly :D! I hope so too :(.